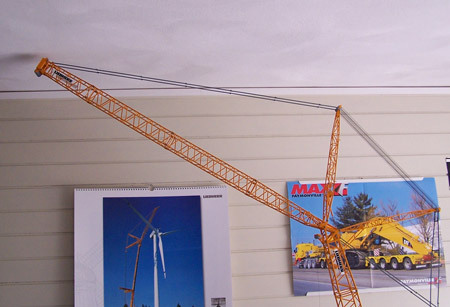 This is the Liebherr LR1750, produced by Conrad. Just like the Terex-Demag CC8800, the LR1750 is packed in a cardboard box. 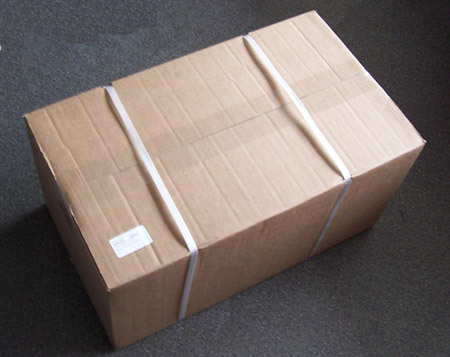 In this box is the three part box with full colour cover. 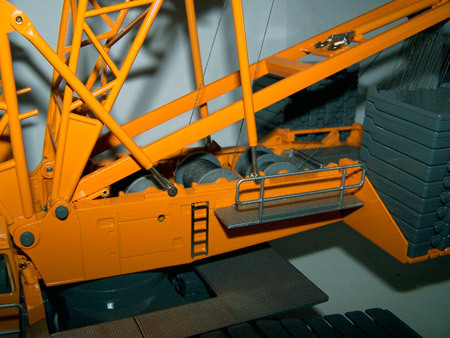 As said, the box consists of three parts: in the first part you can find the stinger and the (54) counterweights, stairs and walkways, the counterweight base plates for the superstructure, the derrickfoot, 14m derrickboom, and parts of the luffing jib. 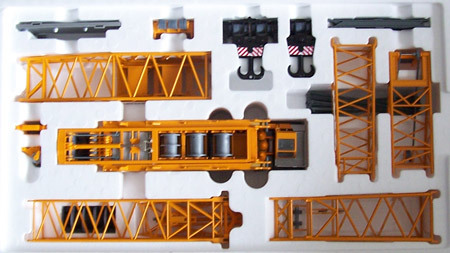 In the second part you can find the superstructure, already mounted on the central part of the undercarriage, boomfoot, boomhead, derrickhead, the head for the luffing jib, 2 hooks, base plates for the undercarriage counterweight, and many small parts and the well known plastic pendants. 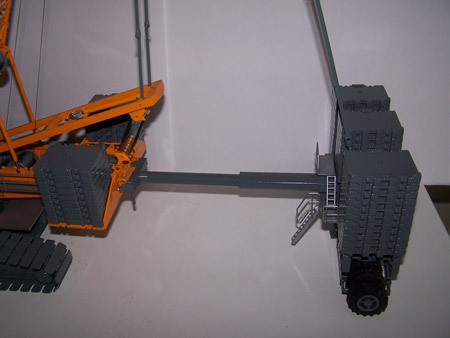 In the third and last part, you can find the crawlers, the ballast trailer and the boom- and jib sections. 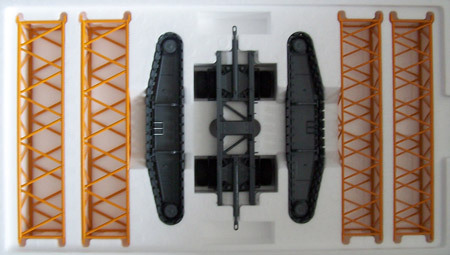 The upperstructure is already connected to the central part of the undercarriage. I am told it is possible to separate these parts, but I haven't tried this yet. 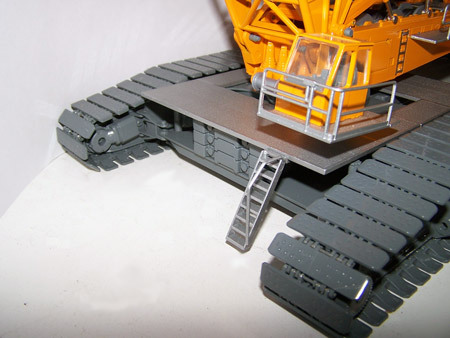 The crawlers are equipped with the same 2 m wide pads as the CC8800. A big improvement is the connection of these pads: these are now connected with pins. The crawlers feature a working tensioning system. 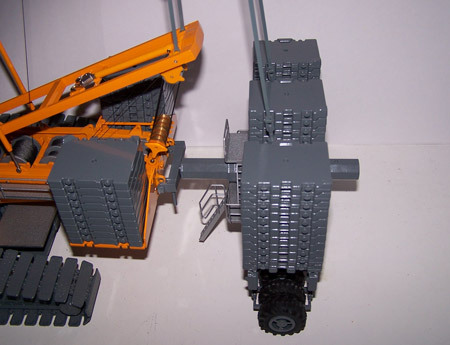 Except the ballast trailer, this are all the counterweight parts. These parts are good for a total of over 5 kg counterweight. The fully loaded ballast trailer puts almost 3,5 kg on the scale. The LR1750 is features a lot walkways and stairs. 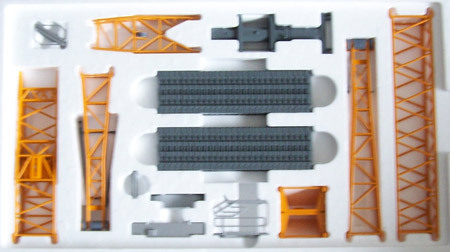 At the left the two undercarriage walkways, with at the right from top to bottom the bridge over the stinger, the walkway for the superstructure, the ballast trailer walkways, the undercarriage stairs and the stairs of the ballast trailer. At the top right the two floor parts of the ballast trailer. 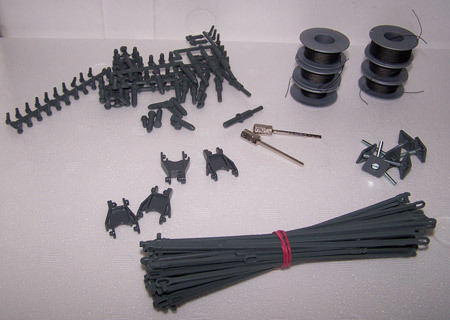 These are the small parts which can be found in the box: various sizes pins, six spools of wire of different length, two screws for the winches (suitable for a cordless drill), six outriggers, a lot of plastic pendants, and 4 supports for the undercarriage counterweight. 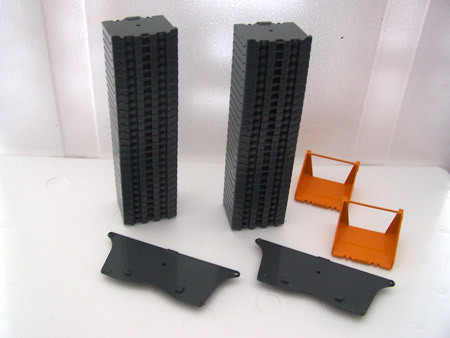 The model comes with two hook blocks. 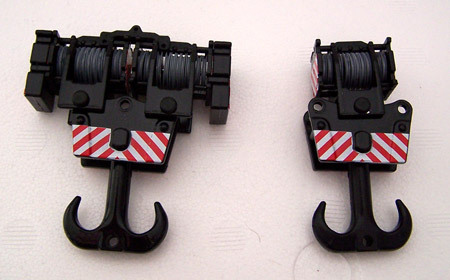 The removable ballast parts on the large hook are a nice detail. Unfortunately all hook blocks are 1 sheave short, ten instead of eleven. There's enough space though to replace the ten plastic sheaves with eleven brass sheaves. 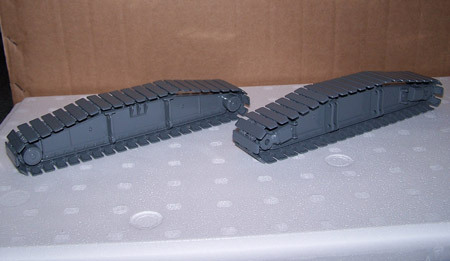 The walkways just lay on the undercarriage, nevertheless they make a nice flat platform. 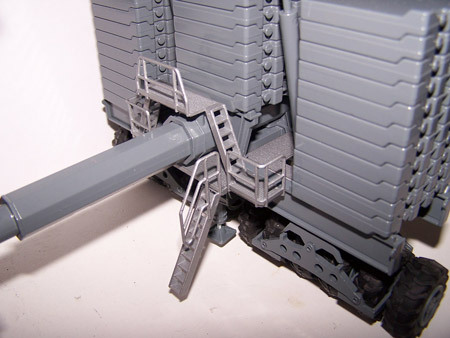 Just as with the CC8800, the stairs fit into an opening in front of the walkways. Where this is a loose connection on the CC8800, they fit nice and tight on this model. Two out of three holes of the winches are hidden by this walkway. On my model the connecting pins of this walkway were too thin, causing the walkway to hang. I have solved this by painting the pins with a few coats of clear paint. The ballast trailer is nicely detailed with all those stairs and walkways. ...or at 20 meter radius with fully extended stinger. After assembling the crane itslef, there are 30 pieces of counterweight (total 375 metric tons) left for the ballast trailer. According to Liebherr specifications there are at most 29 pieces of counterweight (362,5 metric tons) on the ballast trailer. The trailer itself included, this makes a total of 400 metric tons. The LR1750 is due to its size, color scheme and detail a real eyecatcher. In a normal room, it just fits between e.g. a desk and the ceiling.